Good morning! I'm so happy it's Thursday. That means it's almost the weekend and I'm super excited for the weekend! Shaun and I have plans with family and friends all weekend long to celebrate the holiday. It includes dinner with great friends, a city day with my mom, sister, cousins and aunt and celebrating Easter with both sides of our family. Busy-ness! Ok so I tweeted yesterday that I had devised the dessert to top all Easter desserts and that I couldn't wait to share with you today. Well, it's not quite ready to be shared. I need a little more time to perfect it so I'll be sharing it tomorrow, I hope you'll stick around until then! Instead, I'm sharing another fantastic, fun and unusual recipe that can be enjoyed by all, be it for Easter or not. With a $1 bag of jelly beans, I changed up a classic sugar cookie, making it not only pretty to look at, but also a satisfier for any sweet tooth. I love adding some seasonal treats into a classic cookie to turn up the fun. This is adapted from a classic recipe that I found in my sweet Betty Crocker Cooky Book. It is so basic and simple and that's really all you need when it comes to cooking and baking. Oh and it includes a whole cup of shortening. My grandmother would be so proud. Preheat oven to 400 degrees. Mix together (via stand mixer, hand mixer or a good ol' wooden spoon) the shortening, sugar and eggs very thoroughly. Stir in the buttermilk. In a separate bowl, whisk together the flour, baking soda and salt. Add to the sugar mixture and mix until completely combined. Slowly stir in the jelly beans, careful not to overmix the batter. Cover with plastic wrap and refrigerate for 1 hour. Once chilled, drop teaspoon or tablespoon (I used the latter) sized dough balls onto a greased baking sheet. 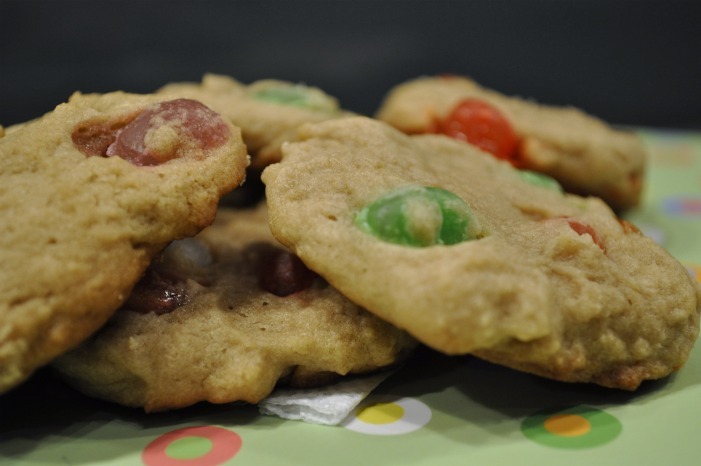 Make sure to get jelly beans into every cookie, preferably near the top of the cookie. Bake 8-10 minutes until the bottoms start to brown and the tops are slightly firm. So there you have it. A quick and easy cookie with a little extra sugar fun thrown in for good measure. Hope you enjoy! What's your favorite seasonal dessert or candy?